With over 1 billion monthly active users, Gmail is one of the most popular cloud powered e-mail services on the internet, giving you the full access to the incredible suite of powerful Google tools and services that are part of their vast online infrastructure. Emails that come to your free Gmail account will be put through one of the best spam filters in the world, and will be ready to be integrated with other Google services, such as Google Docs, Google+, Reader, Google Chat, and more. World’s most popular webmail client! Gmail is the world’s most popular and widely used web-based email provider that enables everyone to easily access their mail account directly from their web browser or a dedicated application on portable devices (smartphones, tablets, and soon even smart watches and smart glasses). 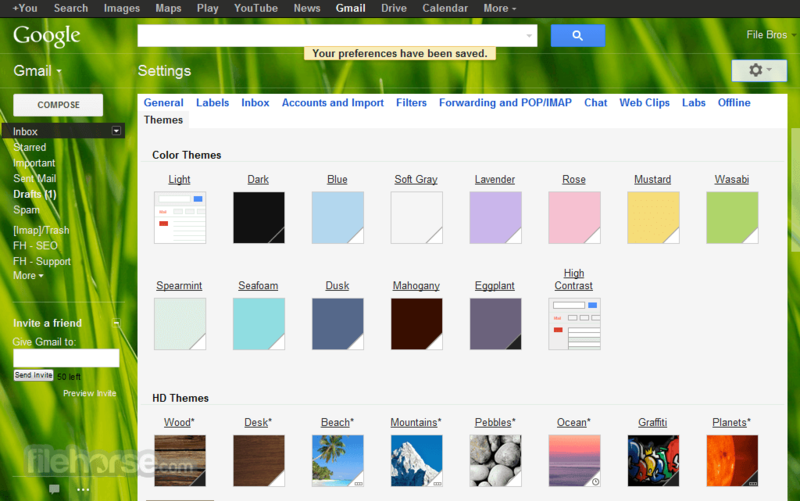 Built on top of the powerful cloud architecture created by Google Corporation, Gmail features countless tools and features that are necessary today for email management, together with many unique features that have enabled it to become so popular. In addition to basic email features that many other free email service providers offer to their users, Gmail manages to distinguish itself by its integrated connectivity with many other Google services, such as Google Calendar, Google Drive, Google+, Google Talk, and many more. All that is offered to everyone for free, with 15 GB of storage space for your attachments and Google Drive documents. Gmail was intgroduced on April 1, 2004, as invite only service that slowly grew in size and scope over the next few year, managing to slowly upgrade all of its initial functions into the modern state that know today. One of the largest advances happened during 2007 wen Google introduced their Google Docs &Spreadsheets, which were directly integrated into Gmail, enabling everyone to taste for the first time online collaboration and office productivity of a new Web 2.0 age. It exited beta in 2009, and from that point on its popularity grew with each passing month, managing to surpass all other similar services like Yahoo! Mail, Hotmail and AOL. 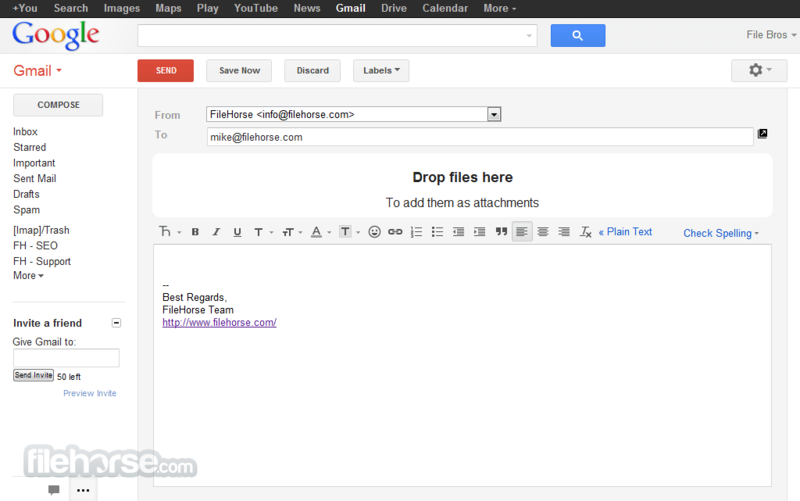 The basic features of Gmail include standard options such as email creation, management, storing, sharing, with all tools that enable you to to take full control over your inbox. Main inbox is separated in 3 sections (Primary inbox, Social inbox and Promotions), with powerful Google servers automatically determining where each email needs to be placed (you can off course manually tweak things, although this approach works excellently even if its left alone). This enables you to have your main inbox account clutter free, with all social and promotional stuff being relegated to their own sections where they won’t bother you. Some other features of Gmail are offline browsing with official Chrome browser extension, integration to Google+, full support for text, voice and video chat directly from the inbox, Gmail Labs, powerful spam filter, money transfer with Google Wallet, and much more. Interface of Gmail is easy and intuitive, with 3 clearly visible inbox sections (Primary, Social, Promotions) where your emails are placed. All navigational objects are placed in easy-to-reach areas, email editor at first glance looks bare, but it has cleverly hidden email formatting options, and search bar enables you to quickly find any email in your inbox. Making a new account for Gmail is very ease, but don’t forget, if you have already created account for any other Google services (YouTube, Google Play, Google Drive) you already have all the necessary login credentials. All features of Gmail free email client are available for everyone for free, and you can only pay for increased storage that is shared between Gmail, Google Drive and Google+ Photos – 100 GB costs $4.99/month and 200 GB $9.99 month. Gmail is without a doubt one of the most powerful, versatile and innovative web-based email clients that you can find today. It’s free, accessible, heavily integrated into Google ecosystem and gives you total control over everything Email related. You don't like spam. Nobody does. 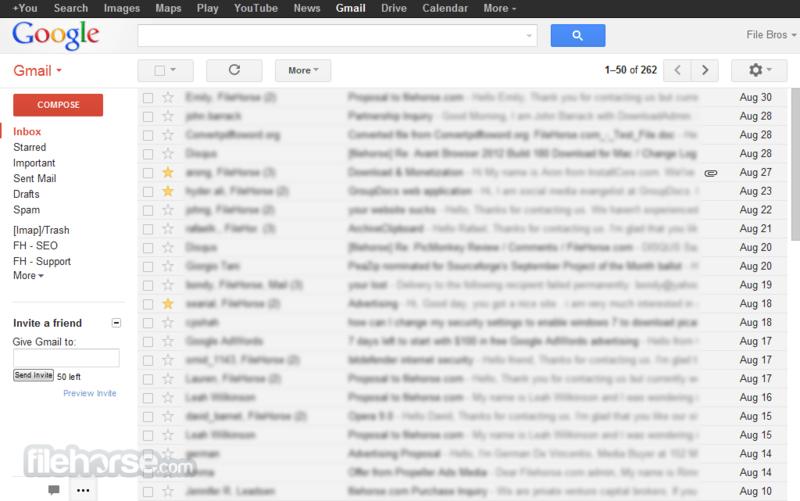 Gmail blocks spam before it gets to your inbox. 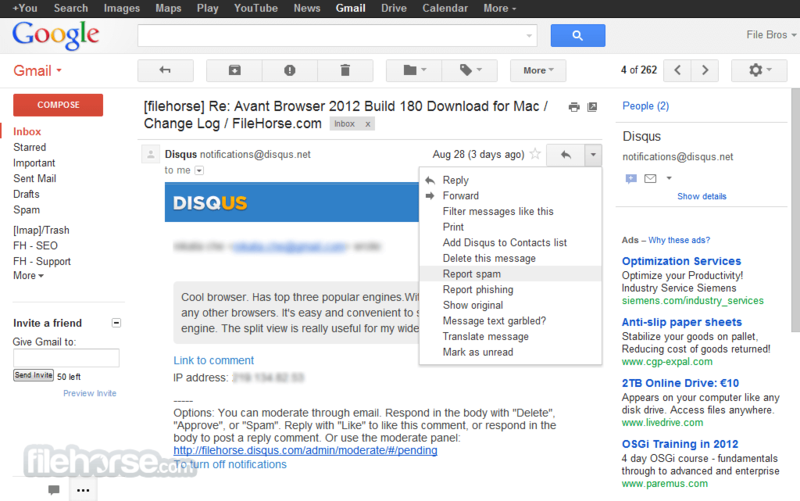 Search instantly within Gmail to find the exact message you want. Messages are grouped with the relevant responses -- so you can always see messages in context. 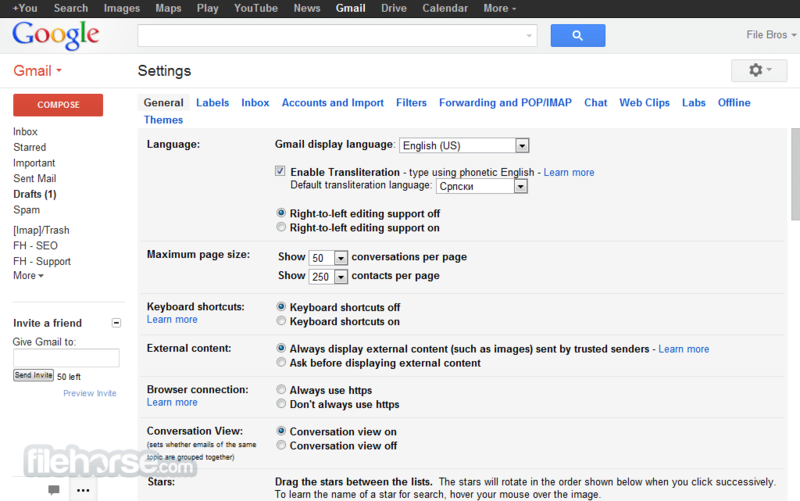 With just one click, you can chat in Gmail or talk face to face with voice and video chat. Access Gmail from your phone – regardless of which device you use. Over 10266.311224 MBs of free storage space – and tons more to purchase if you need it. Call any phone in the U.S. and Canada for free and get low rates to other countries. Automatically separate important email from everything else and focus on what really matters. Just like bank websites, Gmail uses HTTPS encryption to keep your mail secure. All this for free? You betcha.